The dinner took place at the Croatian Hall in Willoughby. It was well attended and the audience was enthusiastic. 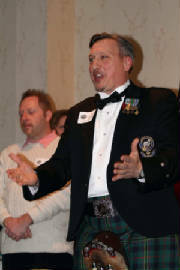 Three pipe bands played, the Heather Belles danced, and the food was delicious. 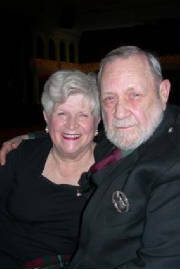 Country Dancing was lead by Michelle Cameron Bozeman and David Leifert. Music by the Music Makars was lilting and fun. 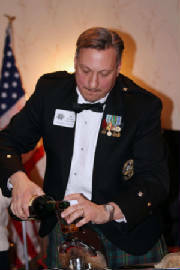 Craig Shepperly was the dashing emcee and toasted the ladies admirably. 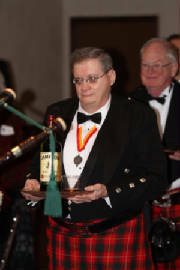 Donne Shepperly gave the toast to the laddies. A really fun time was had by all. 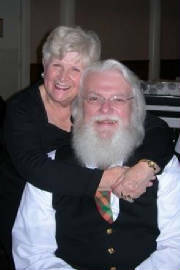 Who wouldn't give Santa a hug if they had the chance? 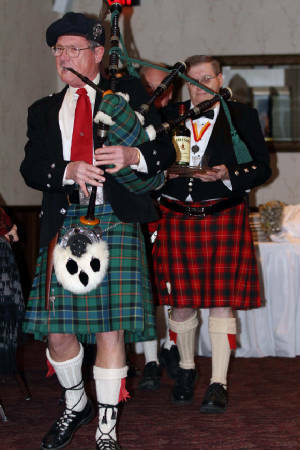 Alan Day piped in the Haggis at this Burns Dinner. 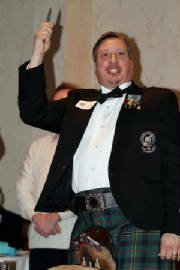 Our own Bill Kennedy gave the "Address to the Haggis" and entertainment included pipers, the Columbus Highland Dancers, Celic story telling, the Heather & Thistle Scottish Country Dancing - and a "Bonny Knees" contest won by Lew Stamp. Photos by Lew follow. 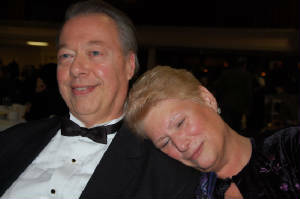 Lew Stamp Photography, LLC, may be reached by phone at: 330-283-0920. He really gets into the drama! 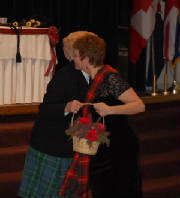 Bill gives lovely lady Bernice Canaday a hug.